March 2017 issue of Science and Knowledge Magazine Safari (Gujarati Edition) is arrived in the market on time. Like every month, this time also we were curious to explore it and provide our unbiased reviews to our readers about the same. As the cover page makes the first impression of any media, let us take a look at that. The cover page is qutie attractive and it suits fully to the magazine, especially it’s genre. There were a few past issues where cover page was giving an impression of a “Nature special” magazine. Since a few issues, there are more creative cover pages are published. 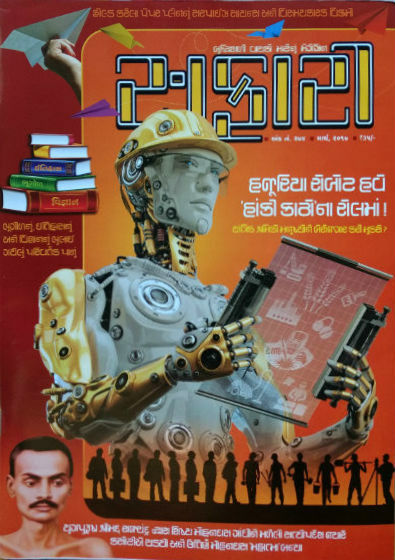 An advance Robot holding a gadget makes the cover page attractive as well. The editorial of this issue talks about very important subject. While talking about the success of ISRO’s mission to launch 104 satellites in one shot (using PSLV), which is a world record, the editor says that we always need to keep the politics and science separate from each other. If political authorities keep dictating things or even interfering in functions of Science and Research Organisations, they will eventually lose the edge. The editor mentions that there were times when USSR was the biggest competitor to USA in terms of Space and Research stuff and now a days we don’t see computers or any other remarkable products made in Russia. This downfall is a guide for all the countries of the world to let Science Organisations do their work. Very true. How many prominent magazines or newspapers raise such points? Late Raychandbhai who later became respected fellow named Shrimad Rajchandra is considered as a very prominent figure, especially in Jain community. He was (and is) considered as an awaken soul. He have some of the unbelievable abilities. He was a “Shatavdhani” (who can focus on 100 things at a point of time, without missing anything). Of course, only a man with great qualities can influence Mahatma Gandhi. We may got disagree with some of the decisions Gandhiji took, but we cannot deny the qualities he possessed or intentions he had. The article explores the time when Gandhiji was just Mohandas Gandhi and was first became victim of “hate people with dark skin” philosophy of British. It was the time when he have started moving ahead in his professional life also. How, his communication with Srimad Rajchandra helped him in staying focused on his goal and motivated him to “follow the truth” regardless of circumstances or situation; is explored in this article nicely. The article also refers to the movement in “Champaran” and how Gandhiji’s actions there have remarkable impacts on cruel British rulers. Overall a nice article. The young generation needs to read to know two things. 1. The spiritual stuff is not a myth, it is a way to stretch you abilities beyond boundaries. 2. The British Rule was a really dark era, and the people who sacrificed their lives for the country to get it free, did really remarkable job. Now it is our duty to make it what they have expected the motherland to be. Here are some external links which you would like to follow, in order to know more about the incidents mentioned in the article. The WikiPedia page for Shrimad Rajchandra. Official website running in the memory of Shrimad Rajchandra. A page exploring relations between Mahatma Gandhi and Shrimad Rajchandra, on mission website. An article confirming Shrimad Rajchandra as friend, philosopher and guide of Mahatma Gandhi. The Wikipedia page about Champaran and Kheda Satyagraha. There is an article in the magazine which talks about three key events, historical, geographical and science, one each. This segment talks about Navy of Bolivia. Now the statement itself should be an interesting one. If you don’t get the point, please refer to the map of Bolivia. Bolivia currently doesn’t have border which touches to a sea or an ocean! Why they have the navy then? Well, rather than talking about what is mentioned in the article we leave it up to you to explore it by reading the article. The article talks about the link between Stalin and Taimur Lang! Both of them happened in different times, so how can there be a link? Well, again, rather than talking about what was the remote link between both this persons, we will recommend you to read the article. The scientific event referred here is the research which was resulted into the medicine of nausea named thalidomide. Considered as a boon, when invented, thalidomide was started selling in more than 40 countries, before the dangerous side effects of the medicine became known. During childhood almost everyone of us have played with the paper planes right? So what is there to much talk about it? Well, there are so many things you can talk about. The science behind the paper plane is very interesting. Red Bull, the famous energy drink manufacturer, arranges a competition for paper plane makers! For your information, the next international event is scheduled in 2018. We recommend you to read the article and also visit the following links to know more about it. We have often seen it in many SciFi movies and read in so many novels of SciFi genre that the rise of Robotics will result into the dark future for mankind. It is presented to us that with the advancement in robotics and especially the Artificial Intelligence will make intelligent robots! And, those robots will then take over to the mankind, ultimately resulting into slavery of mankind! There is a detailed article talking about it, and it is worth reading. In addition there are FactFinder (Q/A) and other sections which are worth going for. Of course, it is a worth to go for magazine. If you like to read quality magazine and want to explore factual information about various stuffs, this science and knowledge magazine is definitely a good choice. We highly recommend reading it. The only limitation is, it is written in a regional language, making it’s target readership limited.